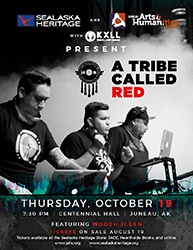 Sealaska Heritage Institute (SHI) in partnership with the Juneau Arts and Humanities Council (JAHC) and KTOO will sponsor a fall performance of A Tribe Called Red, an indigenous music group from Canada that is earning critical acclaim in the global electronic scene and urban club culture. Since 2010, the group—currently made up of DJ NDN, Bear Witness and 2oolman—has been mixing traditional pow wow vocals and drumming with cutting-edge electronic music. Their self-titled album, released in March 2012, was long-listed for Canada’s prestigious Polaris Music Prize and included in the Washington Post’s top 10 albums of the year. The group’s second full-length album, “Nation II Nation,” was released in May 2013 in Canada and the USA through the label Tribal Spirit Music. The album was nominated on the shortlist of the Polaris Music Prize as one of the 10 best Canadian albums of the year and 4 APCMAs (Aboriginal People’s Choice Music Awards, now called Indigenous Music Awards) for best group, best producer, best album and best cover art. Through the group, members are championing their heritage and speaking out on aboriginal issues, while being on top of popular music, fashion and art. SHI is co-sponsoring the event in October as part of its goal to promote cross-cultural understanding and cultural diversity, said SHI President Rosita Worl. “A Tribe Called Red is emblematic of the vitality and evolution of indigenous cultures. They are drawing from their ancient cultures but expressing aspects of their heritage in a new and compelling way that speaks to young people,” Worl said. The JAHC is co-sponsoring the event as part of its mission to cultivate vibrant arts and cultural opportunities in Juneau, said JAHC Executive Director Nancy DeCherney. “We are excited to bring this group. Their contemporary sound blending elements of indigenous music with hip hop and reggae and electronic dance music is inspiring for all of us,” DeCherney said. KTOO, Juneau’s public radio broadcaster, and its sister stations, KRNN and KXLL, are providing in-kind services to help promote the event, as A Tribe Called Red is popular with its younger audience and is heard regularly on KXLL. “We’re interested in supporting and presenting programming that’s relevant to our community” said KTOO’s President and General Manager Bill Legere. The performance is scheduled Thursday, Oct. 19, at Centennial Hall. The Native dance group Woosh.ji.een will open for the band. Tickets will go on sale August 19 at the Sealaska Heritage Store, the Juneau Arts & Culture Center (JACC) and Hearthside Books and online at www.jahc.org and www.sealaskaheritage.org and range in price from $5 (child) to $35 (premium). Proceeds will cover the cost of producing, staffing and promoting the event. The group’s tracks are available on their website at http://atribecalledred.com/music/. The Juneau Arts & Humanities Council incorporated in 1973. It is the formal arts agency for the capital city of Juneau, Alaska, and operates the Juneau Arts and Culture Center (JACC), a vibrant community center providing a location for concerts and events, rotating gallery, and a lobby gift shop. The Council offers programming in performance, visual, literary, and arts education as well as grants, scholarships, and helpful resources for local artists. KTOO is Juneau’s locally owned public media service, connecting Juneau with the rest of Alaska and providing information and entertainment to Alaskans through a variety of media services. Founded in 1972, the organization provides news and public affairs and arts and cultural content on ktoo.org, three distinct public radio services – KTOO-FM, KRNN and KXLL, as well as KTOO-TV and 360 North, the statewide public affairs channel.